I have read and heard this poem many times. However, it is only with a visit to the Statue of Liberty herself that such a chord struck that my family is living at the golden door. We live only two hours from NYC by train and I have visited multiple times throughout my almost (gasp) 50 years. It seems every time we decide to make the trek, we end up completing the same old tired itinerary. On this visit, I was determined to finally see the Statue of Liberty, Ellis Island, and the Lower East Side Tenement museum and learn a bit along the way. Immigration is currently a hot button issue in the U.S., a very polarizing and debatable topic. Interestingly, the history of immigration in the U.S. has always been a bit of hot button topic -as we learned during our tour. I am sure we came away with many tangible facts about immigration, foreign immigrants, stories of strife and assimilation, and lifestyle. However, what I know we came away with is much less tangible. We experienced so many strong emotions during the tour. While this was a first visit for both me and my husband and the kids, it was incredibly impactful. Perhaps it is our age or the current political landscape that created a void waiting to be filled with information. Nevertheless, in speaking with our children after our visit, they experienced many of the same feelings. Prior to our visit we reviewed age appropriate books together to get a better understanding of what we would be seeing. We also dragged out a family tree from my side of the family which has terrific detail about my maternal great grandparents and their trip from Poland to Ellis Island in the early 1900’s; I have memories of both of them. We also spoke to a friend about his own trip through Ellis Island and what he endured upon arrival from Poland in the early 1950’s. We talked to the kids briefly about their Irish heritage, but were at a loss for the actual story of my husband’s family’s arrival to America. We were left wanting to learn more. 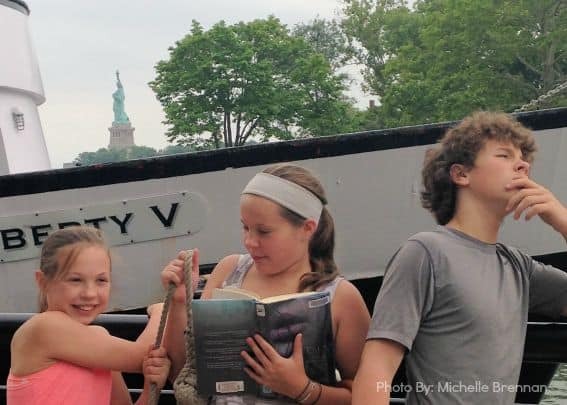 After enduring strict security measures and screening, we boarded the ferry at Battery Park to arrive in a few minutes at the Statue of Liberty. The statue, a gift from France, was dedicated in 1886 and restored three times since. Honestly, I was overcome as the ferry approached Lady Liberty as I thought about the people and my relatives that came before me in search of a better life. I tried to put myself in their shoes as they drew near this storied symbol of freedom. I admit it was difficult to put into words, but I attempted to make the kids be aware of this very important moment. It brought me back to our visit to the Washington D.C. Memorials a few years earlier. I believe the kids understood the significance of those important war memorials, but thought another visit in a few years might really bring the message home. On Liberty Island we participated in a self-guided audio tour that detailed much of the history of the statue, her transportation from France, the fund-raising necessary to create the pedestal she sits upon as France sent her over without one, the selection of the island she would stand at, and more. However, what remains with us the most is how she stands as an ever evolving symbol of American freedom. First, as a tangible gift of symbol of freedom as Liberty Enlightening the World, next as a vision to the many immigrants who watched her grow taller as they approached their new home, then as a symbol of freedom for the civil rights movement, and finally and most recently, a symbol of enduring freedom in the face of terrorism. Lady Liberty was left untouched on September 11th, 2001 and was one of the first visions on the New York skyline as the dust from those attacks cleared. It is because of the war on terrorism that it is difficult to climb inside the Statue as she is so heavily guarded. Reservations to visit the crown or pedestal of the statue are limited and sold far in advance. The kids were of course upset with this fact as I did not plan far enough in advance to score those tickets, but once they were there and felt the magnitude of the symbolism of this special Lady I think they understood that the vision of Liberty from the water or grounds is so much more important than being inside her cavernous body and looking out. 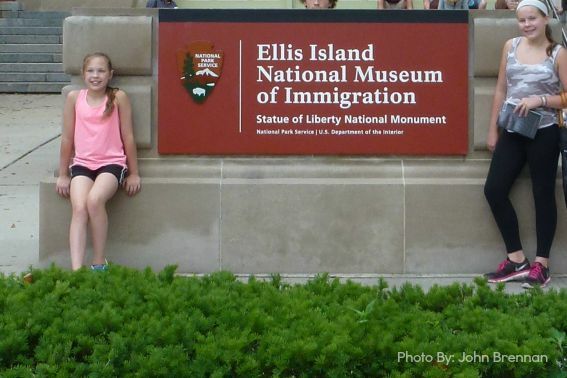 Ellis Island was the next stop on our immigration tour. The ferry boat includes this as a stop and surprisingly, it is less visited than the Statue herself. The area was opened as a museum in 1990 and recently reopened in 2014 after a period of closure due to damage from Hurricane Sandy. 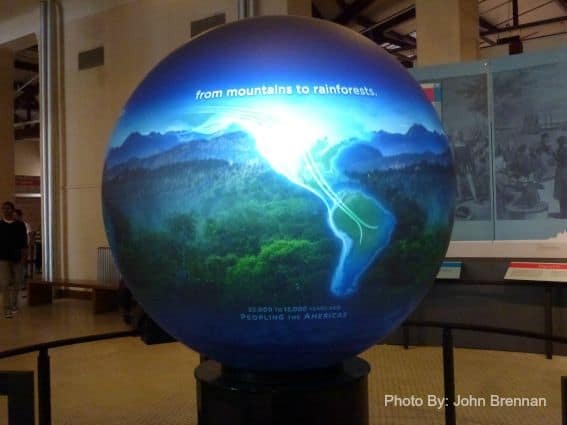 While some of the exhibits have yet to be returned due to damage, there is still a ghostly feeling experienced as visitors wander the halls that once contained so many hopeful travelers looking to begin a new life. The feeling evoked is completely different from that of the Statue. Ellis Island is the location of the inspection station for the millions of immigrants that entered the New York via steamship from 1892 to 1954. The building is imposing and not what I expected at all. Immigrant travelers had this as their first stop prior to settling in other areas where they may have relatives or finding a tenement in Manhattan’s Lower East Side. 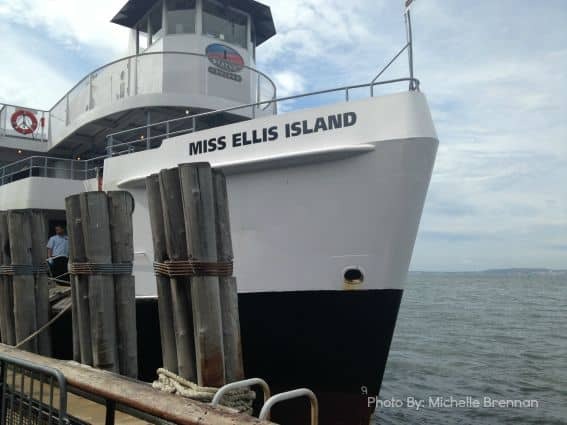 The exhibits here tell the story of global human migration throughout the ages with a special focus on the stories of people who passed through Ellis Island and where they finally settled. We stood in the Great Hall where immigrant travelers waited to be examined and interviewed; it was very easy to imagine being one of hundreds waiting for a chance to get to the other side. Contrary to popular rumor, the inspectors did not change the immigrant names. Those either were changed due to communication errors or by 2nd and 3rd generation Americanized family. Those unlucky few immigrants who had their coats or clothing chalk marked with letters as they disembarked the ship were especially vulnerable for deportation. Letters used included S for senility, X for suspected mental deficit, or LPC ‘likely to become a public charge.’ Those who couldn’t pass the cognitive test, answer interview questions regardless of language barriers, or didn’t have the required cash savings were passed onto special inquiry boards. One of our favorite anecdotes detailed how three sisters passed the same 20 dollar bill from girl to girl without the inspector knowing. Although many people faced inquiry, very few were actually refused entry. 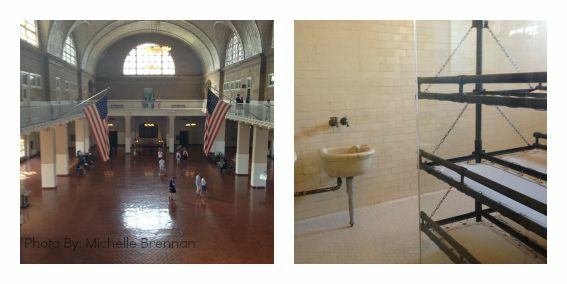 In addition to the Great Hall, visitors can still see the inquiry rooms, the dormitories, the cafeteria, and common areas where many immigrants had to wait for clearance or for family members who were being treated at the on site hospital. So many travelers got sick in sub-par conditions on the steamships. The hospital is on the south side of Ellis Island but not currently open for visiting though funds are currently being raised to ready the abandoned building for tourists. A visit to Ellis Island is certainly worth the trip to get the true feeling of what immigrating to the United States felt like during the immigration heyday. Changes in immigration laws and policy are explained, stories of immigrant lives are shared, and kids can begin to understand what their ancestors encountered while seeking a better life and what immigrant hopefuls of today still encounter. 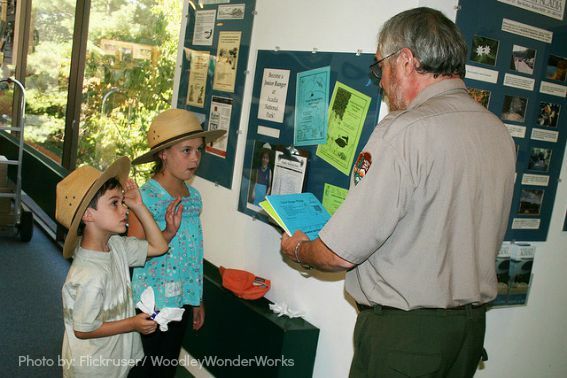 Like other National Park programs, the Statue of Liberty and Ellis Island each offer a Junior Ranger Badge program. Children are encouraged to find the answers in a booklet; the program gets them involved in learning important facts about the attractions. 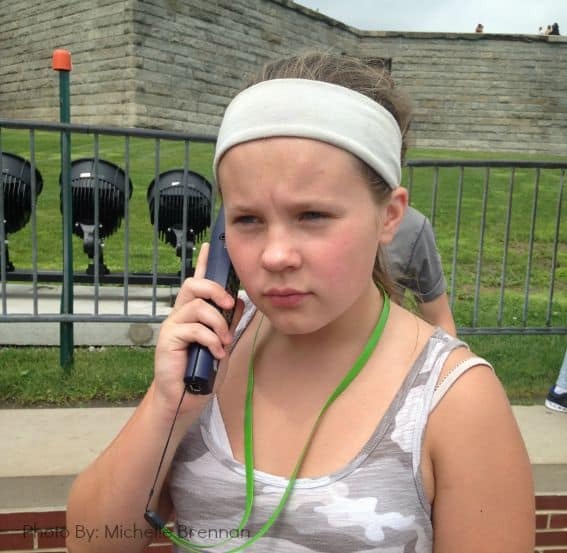 Kids will be experts after answering questions specific to the Statue or Ellis Island. You can pre-print these programs prior to visiting. Rangers are available on both islands to answer questions or provide direction. The Lower East Side Tenement Museum really tied all of our knowledge from our visits to the Statue of Liberty and Ellis Island together. This museum allows visitors to enter the homes of immigrants as they were in the early 1900’s. The only way to visit the homes is to complete a docent led tour. The tours outline the daily lives of different, but real, historical families. Many immigrants settled in the lower east side as their predecessors had done before them. This was the true American Melting Pot I remember from my Schoolhouse Rock childhood days. The living conditions were brutal by today’s standards and difficult to imagine. People from many different countries and religions were forced to live together in deplorable conditions. Many families were living in tiny cramped tenement apartments with one bedroom and a tiny kitchen. Bathrooms were shared and located outside near the water spigot necessary for drinking water and washing. The water needed to be carried by buckets to an apartment via the stairs. Taverns and markets typically took up space on the bottom floors, while lower floor apartments were the most desired even though the smell from the street side latrines and unbelievable piles of garbage on the streets was unbearable. Deaths and sickness from infectious disease like tuberculosis were rampant. And this strife was only the physical part. Discrimination was another part of life’s daily struggle. Every wave of new immigrants from ‘other’ countries was seen as lesser or unkempt. We opted to complete a tour about an Irish family given the Irish heritage on my husband’s side. We were surprised how these families were so discriminated against and what they endured just to get by. Although the family we learned about escaped the Potato Famine in Ireland and were surprised with the ease with which food could be obtained, they had difficulty finding work, being social, and caring for their children. Of our three stops on our Immigration Tour, this is the one that made the biggest impact for the children. They were surprised how much daily life has changed in little over 100 years. They realized how easy they have life now compared to their child ancestors who had to work starting at age 10 or 11 to help feed the family. They remarked on the changes in modern facilities, plumbing, air conditioning, garbage collection, healthcare, and technology. 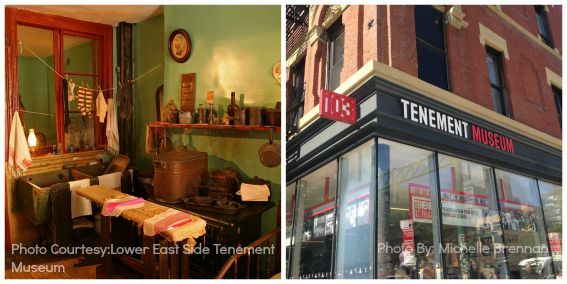 We definitely experienced the mission of the Tenement Museum. The melting pot of the Lower East side remains today. 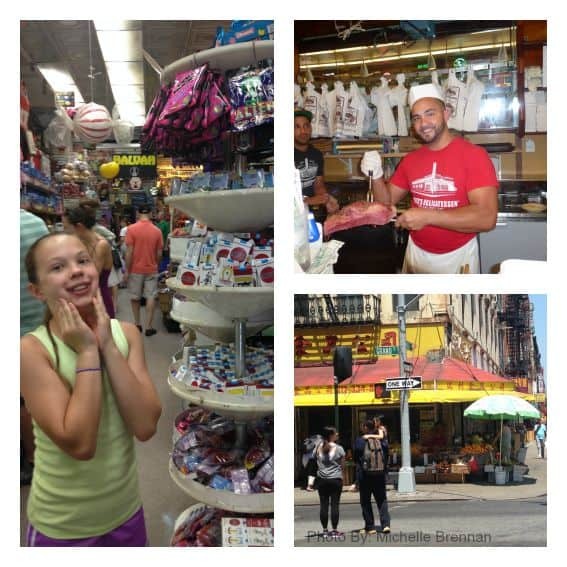 There are amazing Italian pastry shops, Jewish delis, and of course, all of Chinatown just waiting to be explored. When we visited the renowned Katz’s Deli for some ethnic delights, the place was packed, hot and loud, just as we imagined some of those tenement taverns may have been. We stood in line with the throngs to order our corned beef and pastrami on rye, later sharing a long table with two other families. I guess some things never change! As a special treat, we walked a few blocks to Economy Candy. This is a child’s wonderland. Although it cannot compete on theme with Dylan’s or M & M world, it has so much more candy packed into a smallish store. And it is definitely more economical! As we live only two hours from NYC, we have rarely stayed the night. 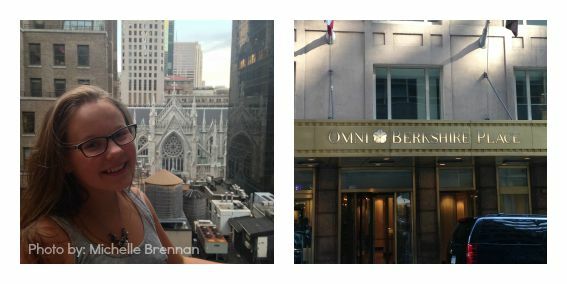 Since we wanted to arrive at the Statue of Liberty early in the morning and spend the day, we decided to stay a couple of nights at the Omni Berkshire Place. Staying the night definitely improved the logistics of the tour. The easiest way to get to all of these spots is by subway, especially when you arrive at Grand Central by train and have no car. Riding the subway is a special adventure on its own. It is best to have a subway map and understand the difference between going uptown and downtown. It took a few rides and mistakes, but we eventually got it! What really helped us with navigation, timing, and restaurants was our friendly concierge at the Omni Berkshire Place. The concierge mapped out routes for us and luckily there was a subway station just two blocks away from the hotel. The Omni is a historical hotel that was originally built in 1926 during the flood of immigration, but is far in distance and style from the lower east side tenements. The Omni offers several suites perfect for today’s family. The 5th Avenue suite has a fabulous balcony overlooking the storied St. Patrick’s Cathedral. This immigration tour of New York brought our family towards a deeper understanding of what our ancestors faced as they searched for a new and better life, a life that we now benefit ‘beside the golden door.’ We are happy our ancestors chose to make America, home of so many immigrants, the place to settle for a better life. In preparation for our trip, the kids read a few books to introduce and familiarize them with the topics covered at these sites. Check out our book recommendations (for kids 6 and up), and then explore our Pinterest board on immigration history in New York City. Follow Trekaroo Family Travel’s board Immigration History on Pinterest. Thanks to Jon Pace the Communications Director at the Tenement Museum for his thoughtful comments. Disclosure: My family and I were provided a stay at the Omni Berkshire Place and I was provided a media pass from the Tenement Museum for a visit. I was not required to make a specific review and all opinions are my own. What a great idea! We first visited NYC when my daughter was 5, but now that she’s 10 I can see us exploring these topics on our next visit to see her cousin. My brother lives in NYC and it would be great to take the kids!